The Android Market has gone through a major update after Google I/O conference. Google has done some refreshing design changes to the interface of the Market for both mobile and desktop and made discovering of new apps easier. On top of that paid apps are now available to 99 new countries, which is a win-win for everyone. Let's start with the improvements made to the online version of the Android Market. The Android Market is continuing to grow larger and larger and here are some statistics to prove it. There are now over 200,000 apps available on over 300 devices. Android users have installed north of 4,5 billion apps. Those are impressive numbers, but they also mean that the Android Market has to be more user-friendly and apps have to be easier to find than before. Hence the new features in the online version of the market. One of them is the revamped Top app charts section. It shows you the apps that are doing the best. They are country-specific, as well, which should make them more relevant to you. Google has also added top new free, top new paid, and top grossing lists to the Android Market home page. Google has also created an "Editor's Choice" which consists of applications chosen by the Android Market staff. Developers doing well on the Market have their appearance on the Top Developers section in homepage, too. Successful developers will get a special badge next to their name. If you are an Android user, you should be familiar with the online version of the Market and appreciate how easy it is to install new apps, without having to go through the app on your phone and do it from there. The related apps section in the Android Market has been made better too. There are now "apps frequently browsed by people who viewed this app" and "apps that people tend to install alongside this app". 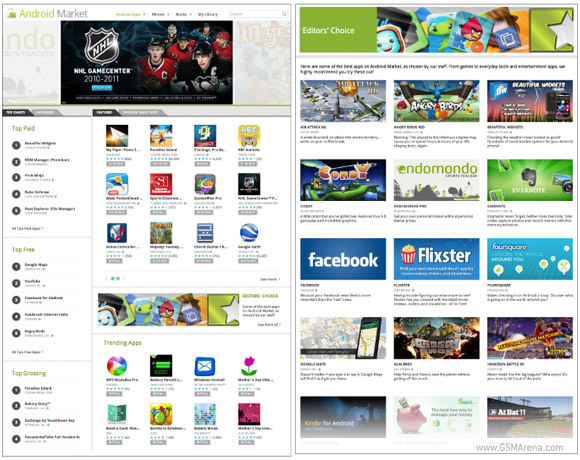 And finally the trending apps section, which lists the apps with the most daily installs. Also the amount of countries, supporting paid apps has been increased by 99 new ones. This means that those countries will have the full access to the Android Market experience (and most of all, paid apps), without the need to employ hacks and mods. Here's the full list. Pakistan, Great news and Thanks Google.